Renewed interest by large investors has been a central feature of the turnaround in sentiment on the gold and silver market. After turning gold into a one-way bet lower in 2013, large investors, primarily made up by hedge funds, have recently turned more bullish as evidenced by a 31% jump in net long positions – bets that prices will go up – held by so-called "managed money". It's not just gold, up 10.3% year to date, and silver enjoying a 14.5% surge in 2014, that have attracted Wall Street speculators. Interest in commodities from hedge funds has been spiking across the board with agriculture and energy prices the main beneficiaries. Arabica coffee is up 20% in a single week, sugar has jumped 5%, natural gas gained 20% and New York harbor diesel added 4% over just five trading sessions. 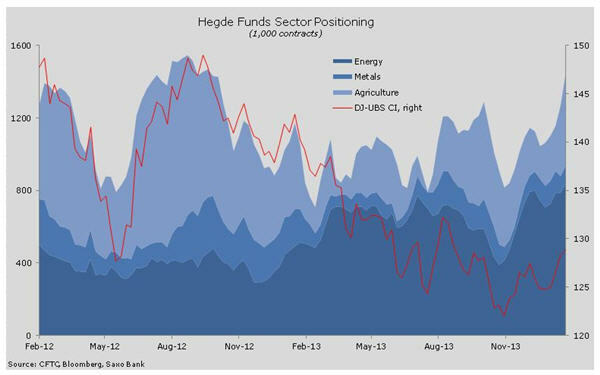 Saxo Bank head of commodities strategy Ole Hansen has an interesting graph showing how hedge funds are positioning themselves in the sector. "Hedge funds were behind the curve at the beginning of the year and since then, they have been an important driver of the current rally. "In just six weeks, the speculative net-long position across 24 major commodities has jumped by 28 percent. "During this time, the grain sector exposure has gone from a net-short of 11,000 contracts to a net-long of 202,000 contracts, softs from 86,000 to 113,000, and energy from 798,000 to 840,000. "The metal sector has seen a reduction from 106,000 to 98,000 contracts but this been caused by 51,400 contracts net-selling of copper while precious metals has risen strongly." Click here for more from Saxo Bank's Trading Floor and Ole Hansen.